Take a closer look as you wander around Madrid. The streets and parks are studded with statues that are more than a little peculiar. One of the most famous oddities in the city is nestled in Buen Retiro Park. Fuente del Ángel Caído stands at a devilish 666 meters above sea level and is a late-1800s depiction of Satan, inspired by Paradise Lost. Look up as you pass 3 Calle de los Milaneses and you’ll see an unfortunate angel who seems to have crash-landed. Make sure you don’t get too distracted by the funny 21st-century sculpture Accidente Aéreo, or you might suffer a similar fall from grace. There’s an altogether more down-to-earth statue at 22 Calle Peña Gorbea paying homage to Ángeles Rodríguez Hidalgo. This elderly woman discovered heavy metal in her later years and never missed an opportunity to rock out, becoming a much-loved fixture at festivals and gigs in the city. Fittingly, her statue is called La Abuela Rockera, the Rocker Grandmother. It’s 4am on a Tuesday and you’re feeling peckish in Madrid. Luckily, this might be the only city in the world where you can get excellent churros at any time of the day or night all week long. Head to Chocolatería San Gines and dunk fresh churros in thick hot chocolate whenever you feel a hunger pang. Now open in five different countries – including Japan, China and Colombia – the original branch in the heart of Madrid has been churning out churros since 1894. In a rush but still want to have a cultural experience? For less than a fiver, you can see a super-short play in Micro Teatro. With a wide variety of genres and showtimes, you’re bound to find something you’re into there. Whether you want to just pop in for one or see lots of plays over the course of the whole evening, you can see innovative, exhilarating performances here that fit in your schedule. Founded in 1725, Sobrino de Botín is the oldest restaurant on earth, according to the Guinness World Book of Records. Back then, every diner had to bring their own ingredients and the cooks would whip them up into a meal. These days you don’t have to worry about carting around your own food, but a reservation is a must for this popular old restaurant. Treat yourself to specialities like roast suckling pork, garlic soup or baby squid, all washed down with sangria. Originally built on the banks of the Nile more than 2,000 years ago, Templo de Debod now resides on a hill in Madrid’s Parque del Oeste near the Royal Palace. Donated to Spain by the Egyptian state in 1968, this is one of the few places in the world where you can see an example of ancient Egyptian architecture outside the country itself. There’s often a queue to get inside the structure, but it’s worth the wait. Afterwards, you can watch the sunset in the shadow of this architectural marvel. Have you ever wondered what life inside an igloo is like? Do you yearn to see the Northern Lights? Well thanks to the Ice Bar Madrid, anyone can become an Arctic explorer. When you arrive, the staff will give you a big thermal coat to put on over your clothes, so you don’t catch a chill inside. Yes, it’s definitely a bit of a novelty and a little pricey, but there’s nowhere else in the city that you can sip a cocktail among ice sculptures all year round. It’s not often that buying cookies is worthy of telling stories about later, but in Madrid it’s no problem. The Convento de Corpus Cristi on Plazuela del Conde de Miranda is a convent of cloistered nuns who sell home-made cookies. But because of their vows, the nuns aren’t permitted to see outsiders, so the entire transaction takes place through a door with a rotating table and you never see the nun’s face! It might take you a few minutes to find the door of the convent but once you do, press the button for “monjas” (the other button is for confession), and then walk into the convent itself. We recommend going early in the day as the cookies sell out almost every day. Around the corner from Sol, Way Hostel is the perfect base to explore Madrid’s museums, nightlife and markets. With tapas tours and Flamenco shows, you’ll always have something to do when you stay at Way. 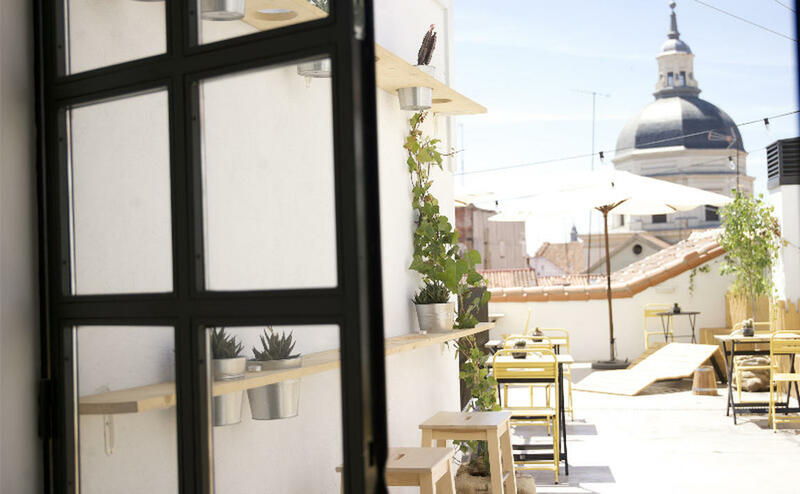 Another central option is boutique hostel The Hat Madrid. It’s been recently renovated and every room has natural light, so it’s hard to wake up on the wrong side of bed. The staff at Sungate One have one objective—to make you feel at home. So if you want to get to know your fellow travellers and the staff better, pull up a seat at one of the community dinners. Plus there are no bunk beds in this hostel, so every room feels spacious. Thanks to christopher_brown, Edmund Gall, Victor Rivera, Harshil Shah, adriagarcia, LARS77722 and Felipe Gabaldón for use of their great images under the Creative Commons license.